Tir Alainn Bed and Breakfast accommodation on the Isle of Skye is a member of the Scottish Tourist Board, graded as four stars with a Taste Our Best award and will provide you with all the comforts you need, together with great food in a relaxing setting. Tir Alainn is a comfortable modern bungalow set in one acre of croft land in an elevated position peacefully overlooking the sea and affording superb views of the Red Cuillin, the islands of Pabay, Scalpay and Raasay and the mountains of Wester Ross, with the added bonus of a seascape noted for its stunning sunsets. All rooms are tastefully furnished. 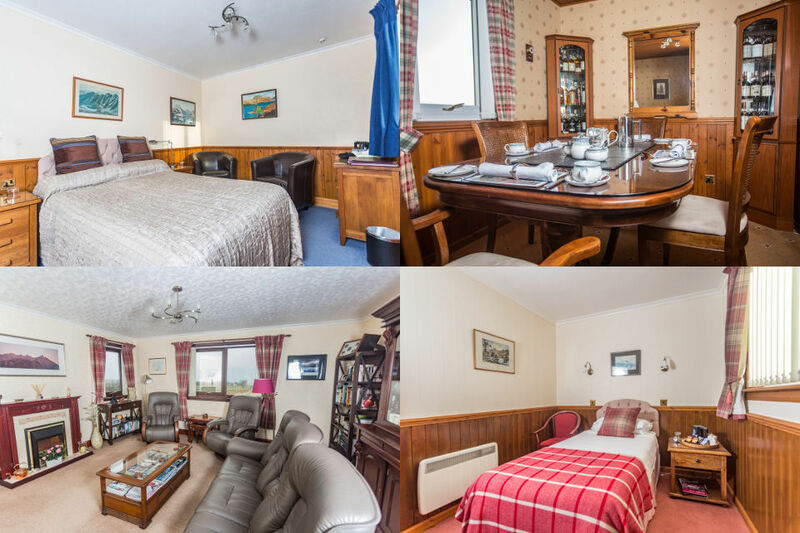 The two doubles, the Hamish & the Heather have en-suite toilet & shower, shaver points,heating, tea/coffee making facilities, alarm clock, satellite TV with DVD and hairdryers, providing great comfort in a relaxing atmosphere. We even provide you with binoculars. Wi-fi internet access is also available throughout the house. We also have a single room, the Seathrift, with en-suite facilities and features similar to the two double rooms. All photographs provided by landscapes365.com.